Warnings are blasted out through loud speakers throughout the day, and shots are fired at night at the Rohingya refugees living in No Man’s Land at Tambru between Bangladesh and Myanmar. “In daylight, the Border Guard Police and the Myanmar Army ask us to leave the no man’s land and return to Rakhine by announcements through loud speakers,” said Md Arif, one of the Rohingya refugees currently living in Tambru. “But at night, they fire blank rounds to scare us so we cannot go back. “How can we go back to our villages if the security forces continue to act like this?” asked Arif. He said the Bangladeshi government had taken all the necessary information to send them to camps in Cox’s Bazar’s Ukhiya upazila, yet no progress has been made on the issue. The situation of the refugees living in the No Man’s Land has worsened after the visit of Myanmar’s Deputy Home Minister Major General Aung Soe, along with a team of delegates from the country’s Ministry of Home Affairs, to the area on February 8. The team asked the Rohingya people there either to return to their homes in Rakhine by accepting the conditions offered by Myanmar, or to leave Tambru giving it up according to Myanmar’s claims that the area is its own territory. Since Myanmar Army’s crackdown in Rakhine state on August 25 last year, 6,500 Rohingya people have been living on the Tambru border, adjacent to Naikhyangchhari’s Ghumdum of Bandarban district. Rohingya people who had fled from the villages of Tambru, Medipara, Raimongkhali, Deybuinna, Laipuiya, Ponduiya, Khuyangcipong and Panirchhora under the Maungdaw township, have been living there. Even after the intense pressure put forth by the border security and the Myanmar Army, the refugees refuse to leave the No Man’s Land as they are scared to go back to their villages. “Almost everyone living in the makeshift camps do not want to go back to Myanmar unless the government recognizes them as their own citizens,” said Mohammad Siddique, an elderly Rohingya man from Deingla village under Maungdaw township in Rakhine. The refugees complained that the Myanmar Army had constantly been planting landmines along the border, and threatening any Rohingya who crossed the barbed wire fence over to the No Man’s Land. Naikhyangchhari Upazila Nirbhahi Officer (UNO) Md SM Sarwar Kamal told the Dhaka Tribune that the administration was observing the circumstances and keeping higher authorities in the loop on the overall situation. After August 25, 2017, more than 10,000 Rohingyas took shelter at no man’s land bordering to Gundhum union’s Konarpara area, Sadar union’s Sapmara Jhiri, Boro Chonkhola and Dochhari union’s Bahir Math area under Naikhyangchhari upazila of Bandarban. In January of this year, all the Rohingyas living in no man’s land were taken to the Kutupalong Rohingya camps. However, the refugees living in the Konarpara bordering area, despite promises that they would be taken to the Ukhiya camps, are still living in Tambru. 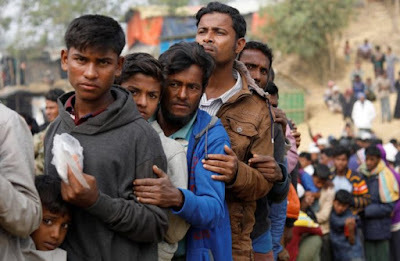 Bangladesh government’s Refugee Relief and Repatriation Commission reported that 689,490 Rohingyas have entered into the country from last year August 25 till February 11 this year, fleeing the Myanmar military’s oppression termed as “ethnic cleansing” by the UN. They joined the Rohingyas who had been living in Cox’s Bazar district for years.